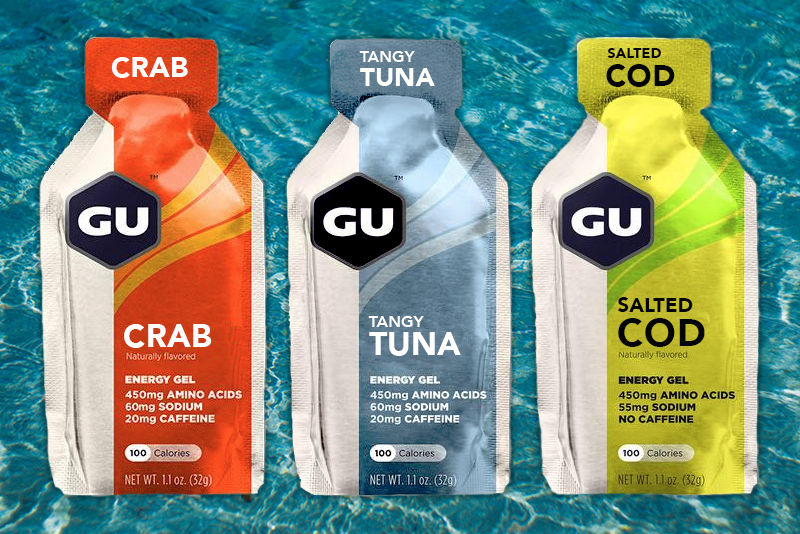 GU Energy Labs has introduced a line of energy gels in savory seafood flavors, marketed to “runners tired of the same old, same old” sweet varieties. It marks an abrupt change for the 25-year-old sports nutrition brand, which traditionally has trafficked in more conservative flavors, such as vanilla, chocolate, fruit, and berry. Our OYSTER flavor is, well… an oyster! Specifically, a sustainably harvested Atlantic oyster, vacuum-sealed for freshness and packed in a natural briny gel. Just rip ‘n’ slurp! The company also said it is planning an extensive marketing campaign to promote the new flavors, including ads (“Good Catch!”, “Get Your Vitamin Sea,” “Flavor Ahoy!”), product giveaways, and a quirky Superbowl Halftime spot featuring Christopher Walken in a getup inspired by the Gorton’s Fisherman. The new flavors, GU said, are dolphin-safe.